The Cleopatra is our full sided Bimini Cabana and provides the most sun protection from the other models. 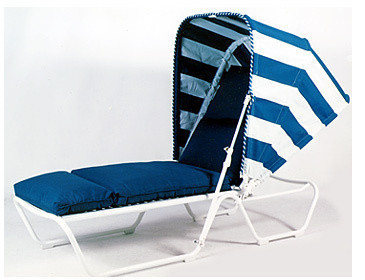 Enjoy your day relaxing in this beach product in comfort and style. The beach cabanas are lightweight with an easy to reach adjustment knob. Many colors are available to match any decor. Easily adjustable, offering varying shade throughout the day. Since an individuals needs change as does the suns angle during the day, the BIMINI can be adjusted to meet the demand simply by turning an ergonomically located Thumb Screw.